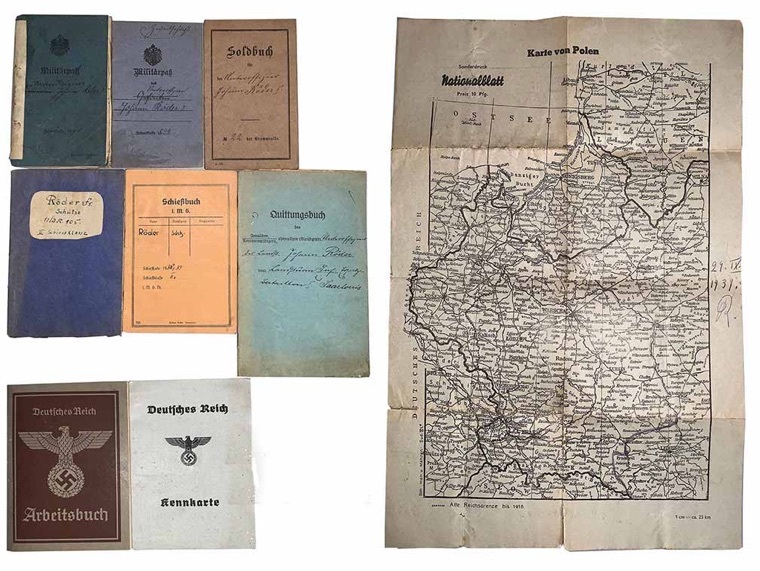 WW1 - WW2 Identity Document Set to Johann Roeder. Roeder was born March 1874, Losheim by Trier. He joined the Army October 1894 and served with 12 Company Prussian Infantry Regiment 69. He attained the rank of Unteroffizier and was released from military service, Spring 1915. Both his original Militaerpass and his replacement Militaerpass are here. 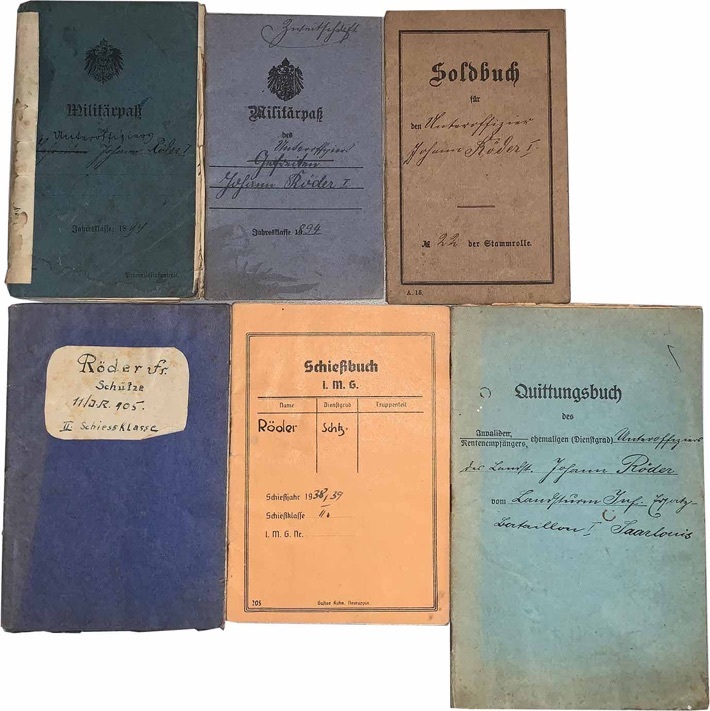 His WW1 Soldbuch was started August 1914, when he was already an Unteroffizier. It shows he was active until September 1915. His Quittungsbuch shows he received military pay and then a military pension at the end of WW1. There are two shooting books for 1938 and 1939. He was then a Schütze with 11 Infantry Regiment 105, and in II Shooting Class. His Kennkarte was started August 1942, and lists him as a builder. He looks quite old in the photo. 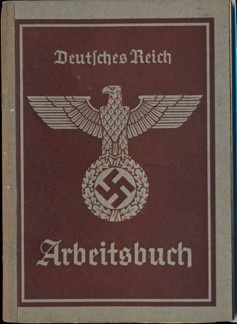 His 2nd style Arbeitsbuch lists him as a builder's helper, It was started June 1941. He owned his own business since 1900. 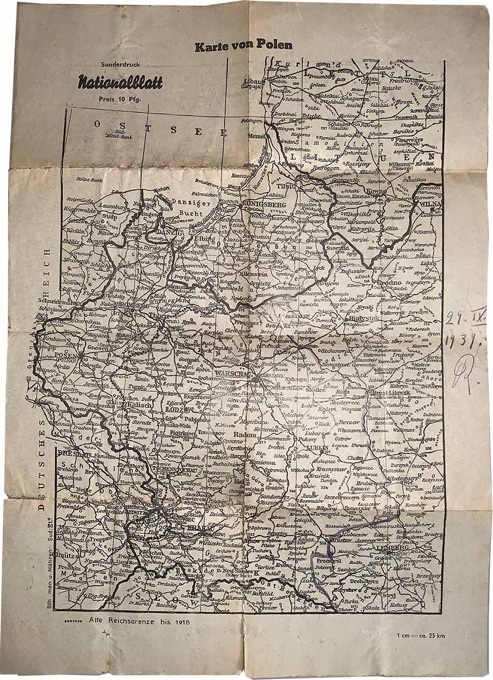 The map of Poland measures about 17 x 11.5 inches. It shows the Reich Borders as of 1915. In the right margin is the date 29.9.1939 and his initial, R.